Bristol-based start-up OpenBionics uses 3D printing to develop bionic prosthetics for amputees and it’s to set to scale in 2017. 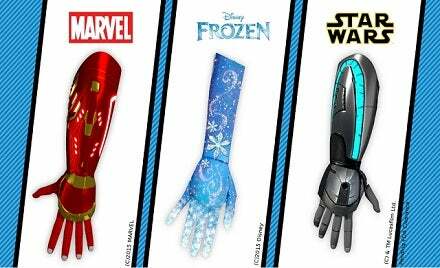 Using 3D printing, the business – which also has partnerships with Disney, Marvel and Lucas Films to produce branded prosthetics that make kids “feel like a superhero” – can make prosthetics which are far more affordable (around £5,000) than other prosthetics on the market. In a panel session at TechCrunch Disrupt on December 6 2016, Open Bionics co-founder Samantha Payne announced that the company is currently raising a seed round and has “big plans” for the new year with intentions to add new designs and expand its team of product engineers. Advanced wearable technology was a key tech trend this year but in 2017 we’ll see this technology adapted to our pets in what’s being referred to pet wearables. While not an entirely new concept – the market is already saturated with several GPS-enabled collars – it’s expected that major pet food brands will start to give away fitness trackers for cats and dogs in 2017. CCS Insight has predicted that brands will create online tracking programmes – like those offered by Fitbit – to “achieve similar levels of loyalty and engagement”. It also predicts that, in particular, pet wearables will be welcomed by insurance companies who may offer owners a discount for pets engaged in a healthy lifestyle; as evidenced by the data from their trackers. Apple’s digital wallet service Apple Pay found its feet this year and, over the next few months, you can expect new developments in ways to pay. For instance, Mastercard is rolling out ways for users to pay with a selfie. This selfie pay system – Mastercard Identity Check – uses biometric authentication to enable app users to simply confirm payment by showing their face to the smartphone’s camera. Selfie pay launched in the UK in October 2016, alongside other key European countries, with the tech set to become available worldwide from the beginning of next year. Mastercard’s app also supports fingerprint biometrics so you can either use your finger or your face to make a payment. Clever stuff eh?